CRE Tech®, Inc., developer of the popular commercial real estate software TheAnalyst® PRO, announces a partnership with the Certified Commercial Investment Member (CCIM) Institute’s Central Arizona Chapter. 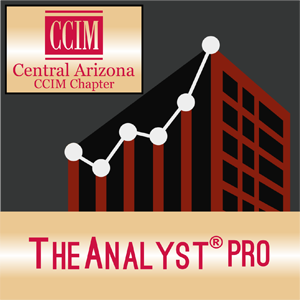 The collaboration involves CRE Tech offering its flagship software, TheAnalyst PRO, to Central Arizona CCIMs at a discounted subscription price. TheAnalyst PRO is a comprehensive toolkit for real estate agents, brokers, investors, lenders and title agents. The robust software features financial calculators, investment analysis reports, mapping tools, location risk analysis, training videos and more—easily accessible via mobile devices and office desktops. This partnership follows CRE Tech’s recent announcements of similar arrangements with Fidelity National Financial, Sperry Van Ness International Corp., the Northern California Commercial Association of REALTORS® and the Ottawa Real Estate Board. CRE Tech, Inc. specializes in developing and licensing mobile technology and marketing products. Creators of the award-winning and top-grossing TheAnalyst® PRO software (www.theanalystpro.com), CRE Tech works with regional, national and global real estate firms and associations to provide mobile solutions. CRE Tech excels in bringing together client vision with a technology solution that jettisons their marketing strategy to the next level. Learn more about CRE Tech, Inc. at www.cretm.com. The Central Arizona CCIM Chapter promotes the highest ethical standards in commercial real estate, provides quality educational programs to members and related professionals, serves as a forum where intelligence and success can be shared and celebrated, and finally, enhances the awareness and recognition of the CCIM designation to the business community. More information about the Central Arizona CCIM Chapter can be found at www.ccimconnect.com/centralarizona.